VIPAccessEXCLUSIVE: Taylor Lautner, Chuck Liddell, Lance Bass And Many More Had A Spook-tacular Time At The Opening Celebration Of Nights Of The Jack – RECAP Here! It’s a season filled with trick-or-treating, tons of sensational costumes, haunted mazes and ghouls and goblins galore. It goes without saying that Halloween is definitely one of the most exciting holidays that people of all ages love to take part in. From watching scary movies to going pumpkin picking, there are a countless amount of things to do during the month of October as you prepare yourself to get in the Halloween spirit. However, out of all of the spook-tacular things you can do, attending Nights of the Jack definitely has to be the best one yet! A host of renowned celebrities enjoyed some chills and thrills as they attended the opening celebration of Nights of the Jack on October 10, 2018 at the King Gillette Ranch in Calabasas, California. The extraordinary event allowed guests and their families to be mesmerized by the intricate and creative jack o’ lanterns that were exhibited along the half-mile trail at the ranch. 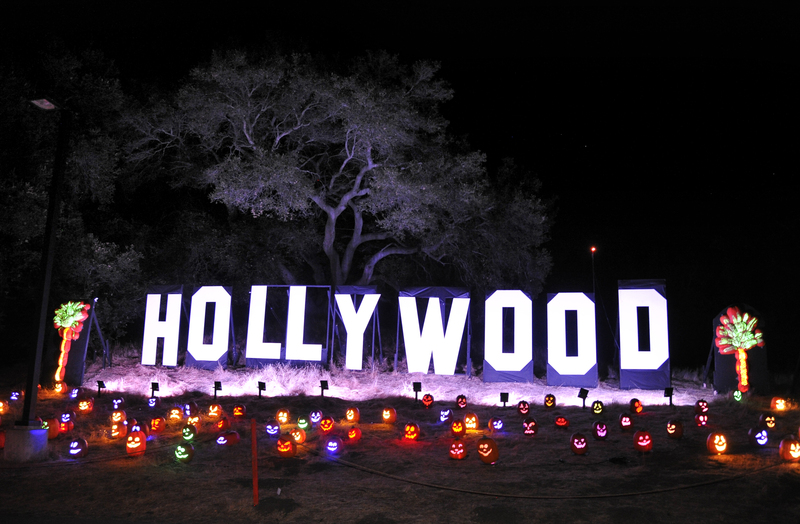 This incredible event truly left everyone speechless with all of the impressive jack o’ lanterns including a jack o’ lantern dinosaur, motorcycles and even one with the iconic Marilyn Monroe’s face carved into it. The jack o’ lantern artists have undeniable skill, talent, passion and dedication and they created some of the most awe-inspiring jack o’ lantern designs. Magnificent celebrities who attended the event include Taylor Lautner, Lance Bass, David Arquette, Gilles Marini, Casper Smart, Jennie Garth and many, many more. The legendary MMA fighter, Chuck Liddell also had a terrific time attending the event with his family and Kendra Wilkinson had a stellar time trick-or-treating and posing for some super cute pictures with her son and daughter at the event. The remarkable event had a candy table where attendees were able to trick-or-treat in advance and fulfill their sweet-tooth with candy corns, M&Ms and more. Of course, all of the thrills and amusement were bound to get people hungry. Nights of the Jack even treated guests with scrumptious burgers and mouth-watering pizza slices from popular food trucks. It’s clear to see that all of the jack o’ lanterns at Nights of the Jack are totally Insta-worthy and your Instagram-game will be brought to another level with all of your amazing posts from this wonderful Halloween experience. In addition to all of the illuminated jack o’ lanterns, guests also get the chance to capture all of their fun through several, exceptional photo-opps. From skull, wooden stand-ups to a giant, black cat and even a haunted chariot, there are so many outstanding props to take pictures with at the event. I, Alexisjoyvipaccess had a fantastic time attending the kickoff celebration of Nights of the Jack and I can honestly say this is one of the greatest Halloween adventures to enjoy. I had such a blast and anyone and everyone who attends will definitely feel the same way. You can join in on all of the excitement starting now until November 4th by heading on over to the King Gillette Ranch to experience Nights of the Jack for yourself! Nights of the Jack is a perfect event for families and friends to attend and you will definitely make tons of unforgettable memories. You can get your tickets for Nights of the Jack here and be sure to follow @NightsOfTheJack on Twitter and Instagram to stay connected! Check out some more pictures below from the opening celebration of Nights of the Jack and comment below and tell me or tweet me at @alexisjoyvipacc, what will YOU be dressing up as for Halloween this year?! Previous VIPAccessEXCLUSIVE: Take A Look Inside Luxor Box’s September Box In Alexisjoyvipaccess’ New Unboxing Video! Next Article: iHeartMedia Announced The Tour Stops, Dates And Performers For The Nationwide iHeartRadio Jingle Ball Tour Presented By Capital One – Get The Details Here!